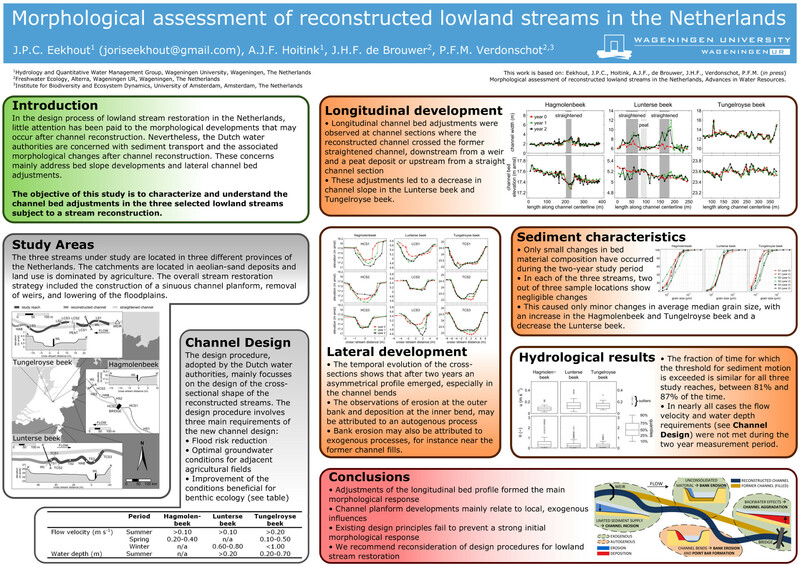 Channelisation measures taken halfway the 20th century have had destructive consequences for the diversity of the ecology in the majority of the lowland streams in countries such as the Netherlands. Re-meandering is the common practice in restoring these lowland streams. Three reconstructed streams were monitored during the initial two years after construction of a new channel. The monitoring program included morphological surveys, sediment sampling, habitat pattern surveys, and discharge and water level measurements. Adjustments of the longitudinal bed profile formed the main morphological response. These adjustments were most likely caused by a lack of longitudinal connectivity of the streams as a whole, interrupting transport of sediment at locations of weirs and culverts. Longitudinal channel bed adjustments and bank erosion were mainly caused by exogenous influences. In channel bends, the cross-sectional shape transformed from trapezoidal to an asymmetrical shape, as found in meandering rivers. This behaviour can be attributed to an autogenous response to the prevailing flow conditions. Due to the fine sediment characteristics, bed material is readily set in motion and is being transported during the entire year. The existing design principles fail to address the initial morphological development after reconstruction. An evaluation of pre-set targets to realise water depth and flow velocity ranges shows the current procedures to be deficient. Based on this unfavourable evaluation, and the two-dimensional nature of habitat patterns needed to improve the conditions for stream organisms, we recommend to predict morphological developments as part of the design procedures for lowland stream restoration in the Netherlands.